The link between Billy Barlow and The Great Dismal Swamp is tenuous but intriguing. It is a never-to-be proven but colourful connection between Sam Cowell’s Billy Barlow and a modern-day American lady, called Cindy, who is studying her family history. Cindy’s great-grandfather was known as “Billy Barlow”, although Barlow is not one of the family’s names. It is likely that we will never find out for sure about this connection that has been lost in a time-mist as impenetrable as the mist of Dismal Swamp itself. Cindy’s great-grandfather was born at the end of the Civil War, in an area that saw a great deal of the action, and where the name Billy Barlow was a very familiar and well-loved one. This may mean that there is a double link to his nickname. Dismal Swamp once spread across two-thousand or more square miles of Southeastern Virginia and northeastern North Carolina. The swamp was first surveyed in 1763 by a company of men led by George Washington. The plan to drain the area was carried out during the next fifty years, and now Dismal Swamp covers only six-hundred square miles. It is still a place of tangled undergrowth, tall strange cypress trees that stand on tiptoe with their exposed roots extended high up out of the water, wild creatures with eerie calls, and a green glow that is never penetrated by direct sunlight. In the one-hundred years after the discovery — by Europeans — of Dismal Swamp, public imagination was stirred by a number of stories, songs, and poems set within its ghost-friendly habitat. Some were ghost stories, some focused on the runaway slaves who hid there, and some were related to the Civil War. Lake Drummond, a moss-green tarn that lies in the very centre, was the location for the first and most enduring of the European style folk-legends that oozed out the swamp. Irish poet ThomasMoore visited the swamp in 1803, before the drainage canal into Chesapeake Bay was completed. He wrote his poem, A Ballad – The Lake of Dismal Swamp, spreading a supposed local legend throughout the English-speaking world. Moore heard the story, or said he did, in Norfolk, Virginia, and wrote his famous poem there in a tavern which still stands in Norfolk’s main street. It’s interesting to note that the local black guide, whom Moore hired for a day’s boating on Lake Drummond, had never heard the legend. Recounting the story almost twenty years later, this guide, now known as Uncle Tony, as a mark of respect for his age, remembered the day of the excursion well. He remembered Moore as a “nice-looking man who talked pretty”. As they set out, Moore poured Irish whiskey, lovingly brought from home in a silver bottle, into a little silver cup, and shared it with his new friend and guide. Moore told his guide about the legend. “De har ‘gin to rise on my hed an’ I ax him ef dat was a fac’,” was how Uncle Tony remembered it. Reassured by Moore, his uisge beatha, a picnic lunch, and the generous payment of a pound, Tony steered the skiff onto Lake Drummond, and Moore spent the day writing furiously in his notebook. and being young, impressionable, and of a poetic disposition, Moore showed no restraint in the telling of this creepy story. There is not much story to tell really, but the poem is vividly coloured by a young poet’s imagination. It is all atmosphere and expert craftsmanship. The old legend, as Moore says he heard it in Norfolk, Virginia, tells of a young man whose true love dies. Maddened by grief, he becomes convinced that she is not dead, but lost in Dismal Swamp. 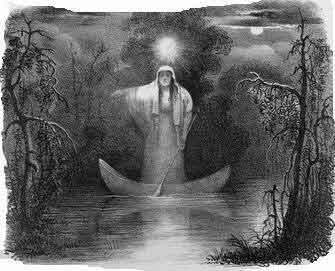 He goes searching for her — or so his friends suppose — sure that she paddles around on the lake in a white birch-bark canoe, her way lit by a firefly lamp. He plans to hide his true love in a cypress tree where Death can’t find her. He is never seen again in the flesh. Thomas Moore takes up the tale at the point where the legend trails off. He makes himself his very own white birch-bark canoe and paddles off across the lake, following the meteor, never to return. And paddle their white canoe. This e-book is being made available free of charge but we would welcome a purchase from our shop.